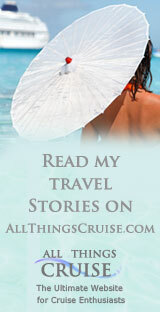 While I love to visit the exotic ports on a cruise, I enjoy the days at sea almost more. I suppose that is why I am on a cruise that will spent eight days at sea with no port stops as we cross the Atlantic. Today we slept in, had a leisurely breakfast, then an espresso in the coffee bar. We walked the deck, worked out for an hour in the gym, and drowsed by the pool with a book. This evening dress was formal for dinner, and most guests were nicely turned out, although this is a much less formal ship than the Cunard line, for example. The captain had a champagne reception before dinner. He is from Eindhoven, a town in Holland that we know well. Today we slept in, had a leisurely breakfast, then an espresso in the coffee bar. We walked the deck, worked out for an hour in the gym, and drowsed by the pool with a book. Awesome post and very insightful. I have just finished a cruise across the atlantic and it was incredible! Forte schools offer a FREE trial lessons for classes and some offer Learn Piano, Guitar, Singing, Saxophone, Flute, Violin, Drums and More a Free Trial private Piano classes Sydney. What do you know about this http://24locksmithnewark.com/ locksmiths? Is it reliable or not? Please answer me. Thanks! What can you tell me about this locksmiths service? http://24-locksmith-miami.com/ Is it safety for my locksmiths' device? Visit Chicago's finest parks with a grand limousine service. Not only you will have great time but also will experience the luxury Chicago limo service can bring to your trip. Great post. I really stumbled on your blog and enjoyed reading the post related to the transportation services. Book shuttle, limo, and other transports from Denver to Vail according to your need. We offer the best Chicago Limo Service rates including Private Chauffeur, Airport car service, Executive Transportation, Stretch Limo Rental, SUV Limousine service, Mercedes Sprinters & Party Bus. I feel strongly about it and love studying extra on this topic. If possible, as you develop into expertise, would you mind updating your blog with more particulars? It’s extremely helpful for me. Large thumb up for this blog publish! Thanks for sharing the article on the limo service providers. Looking to hire professional limo services. Then, book your ride with Peterborough limo hire and enjoy your ride. Our local locksmith team serves Fayetteville, Spring Lake, Fort Bragg, and the surrounding areas. We have 32 years of experience with some of the best locksmith equipment on the market to help serve you better locksmith Fayetteville NC. We are always professional and honest.